SUMMARY: "I learned it the hard way: nothing beats sitting down and actually doing the work. You look at your analytics," Anton Kharkov, Founder and CEO, UPS Battery Center, said. UPS Battery Center was struggling with a site search engine that was losing the company leads. The team needed a solution, and they needed it quickly. Learn how the team solved this problem, developed some creative solutions in the interim and capitalized on the site's analytics. This solution, paired with the company's new focus on analytics, attributed to increasing order size by 140% and revenue by 125%. UPS Battery Center is a manufacturer of sealed lead acid batteries and is corporately based in Toronto, Canada. "It's an ancient type of battery. It's been around for over 100 years, and it's used in many, many industries," Khramov said. According to Khramov, the company serves a large variety of industries, including children's toys, flashlights, fish finders and standby power devices. The brand also manufactures accessories, but its main line of work is battery-related. Because batteries are utilized in so many different industries and products, catering to UPS Battery Center's customer base can be a challenge. A majority of the company's customers tend to be industrial and large organizations. However, in recent years, the company has also been gaining smaller businesses as clients. The company ran into a problem that should be familiar to any manufacturing company with a large product base and an ecommerce presence: UPS Battery Center's site search was suffering. Because the company featured so many products that spanned so many different industries, the site's search engine was not producing the results it should have. "If you have 100 products, there's not much to search. You can just browse the listing. When we started having 12,000, 13,000, 14,000 products, it became intolerable and unbearable," Khramov said. "It was like a machine you couldn't wield. It just did whatever it wanted." Customers were having a difficult time finding products, which was losing sales for UPS Battery Center. The search function was so troublesome, the salespeople were having a difficult time locating the products themselves, he said. This roadblock made the sales cycle incredibly difficult in an already-competitive industry. "When customers can't find it and you can't find it, that's definitely a loss of a conversion," he said. Khramov and his team looked into the issues they were having with native search and realized that its backend platform was incapable of effectively indexing the massive volume of products with similar characteristics that UPS Battery Center needed to showcase. To understand the complexity of the search engine the company needed, Khramov pointed to the 12-volt batteries his company sold. It is one type of battery, but the company sells roughly 1,000 products related to this one battery. From a customer's end, a search for this common battery could produce upwards of 12,000 results. To remedy this costly search problem, Khramov started looking for plug-ins that would fix his site. In the process of finding this solution, he and his team gained a better understanding of site analytics and their customer base. UPS Battery Center was able to determine there was a problem with its site search through its customer service center. After so many customer calls, the team looked into the backend of its site and discovered that the native search on the site's platform was the issue. Khramov and the UPS Battery Center team quickly decided that a possible solution to the search problem would be to install a plug-in that would better organize the company's search, but they were unaware of what the ideal plug-in would be. While he sorted this out, UPS Battery Center was still losing conversions and revenue from its current search system. The marketing team developed a few temporary solutions in an attempt to combat the damage this problem was causing. Every person had a notepad open on their desks with shortcuts to popular products, and many people memorized URLs to give to customers who were calling, Khramov said. This approach worked for a while, but it only helped customers who had the patience to call in to find the products they were searching for. "Some of those people did convert … But who knows how many conversions — probably 99% of those people — went online, Googled the next result and bought it somewhere else," Khramov said. It was a critical piece of infrastructure, he added, because customers were calling and "we have no answer for them and I say to them, 'I'm sorry. I can't find the product. But I will call you back in the next hour once I find it on my own website,'" he said. "It was like a life and death emergency." While the team was doing its best to meet the questions of UPS Battery Center's customers, Khramov was aggressively searching for a plug-in that would fix the site's search. "I started buying every plug-in, reading all the forums and begging the community for help because [our site platform] is like an open source community, and those people are so nice, but nobody had the answer to that at the time," he said. According to Khramov, he bought every plug-in he could find that had the potential to fix the site. Some would crash the site, which was obviously only an additional problem to deal with. Others appeared to work but would then crash the checkout process. Less obvious issues than that typically took a couple of days to figure out. This process lasted for months, which Khramov said caused many sleepless nights. "I remember trying to learn PHP at one point. I was like, 'That's it. I'm going to write my own. That's it,'" he said, recalling his frustration. 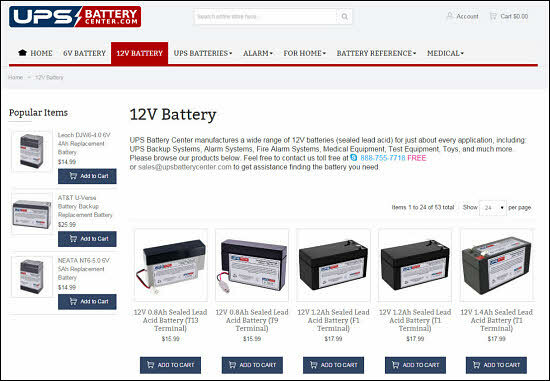 Finally, Khramov came across an extension that seemed like it would work with UPS Battery Center's site. This particular plug-in was designed to take a large product catalogue, index it on the vendor's server and organize it in a way that lets site visitors search more naturally. This solution was more like Google's search engine than UPS Battery Center's old search, in that it is end-user focused and able to account for typos. However, even though this was all on a different server, the results still appear on UPS Battery Center's site. "As soon as we installed the plug-in and it indexed — I don't know if it took five minutes or 10 — but immediately the results that started coming up on my front end search on the website were relevant, which was huge, especially with the small differentiation between the products," Khramov said. "So we started really test driving it do make sure that it actually works, and it did really work. It made a huge difference overnight," he added. In addition to indexing UPS Battery Center's search results, the installed plug-in also gave the team a digest of different keywords used based on actual customer behavior and a way to manually curate search results without having to write code. Khramov and his team utilized this feature as a way to optimize their site without spending extra money. The team found two big differences in how customers searched and how they indexed inventory when it came to product descriptions. The first was one that any Internet user can relate to: Customers would often misspell what they were looking for. To account for this, the team simplified terms. The second discovery took more effort to correct: Customers were not searching for products in the same ways UPS Battery Center indexed them. According to Khramov, the company used to organize and describe its inventory using very technical terms. This made sense on the company's end. That was how batteries were referred to in the industry and how the company worked with them. However, customers were searching using different, and often simpler, terminology. "There's a flashlight or a camping light and [customers] want a battery for it. They don't really know what battery is inside of it, but that is the battery that I sell. So I was able to see that right through the analytics," he said. From looking at these analytics, Khramov was able to adjust product descriptions to be more customer-focused. "I started adjusting the description to make sure that it appeals to the customer for the way they see the product. The fact that it's the different terminal types, they don't really care about it. They want to make sure that it works in their particular application. 'Plug and play' is really the term as what they're looking for," he said. Studying the site's analytics also allowed UPS Battery Center to confidently expand its product selection. According to Khramov, the team noticed that customers were calling and searching for products the company did not sell in large volumes. The company then started adding more of these products as well as products it didn't already sell but knew the customer was interested in, boosting revenue. "So it's a cycle that I can create and see what products people are looking for, stuff I never even thought of. And I'm in the industry," he said. Studying analytics has also led to UPS Battery Center adding premium versions of products customers are searching for, which will give customers a better performance. For example, say there is a fish finder with a battery life of two hours. The team can now introduce customers to a premium battery for their fish finder, which lasts up to three hours. It's a better product that the customer will appreciate knowing about, but prior to this search reorganization, customers may not have known that this better product exists. "When I go in there and I see that a specific category is being searched for, I'll provide them those premium options by sorting the search results. Again, what that does, it's an upsell. The customer gets a better product. They're happier with it in the long run," he said. UPS Battery Center has seen a large amount of improvement from optimizing its search. Whereas before, the company was losing a countless number of ecommerce conversion, it can now track the search habits of its customers and alter its product inventory based on analytics. Khramov credits this success to listening to what his customers actually want rather than merely speculating. This is where analytics becomes essential. The information you need to drive a lot of value is already there through analytics, he said. Embracing analytics has been such a big transformation for the UPS Battery Center team that Khramov is now hiring a person to work full time just on analytics. "You have to really dig into that and get the information out if it. That's hugely important. Once I started understanding that, it made a huge difference to our sales, to our customer satisfaction," he said. "I think being in ecommerce, I think we always look for a solution that's sort of quick and like magic, 'Oh, just put this in and this works,'" Khramov explained. "I learned it the hard way: Nothing beats sitting down and actually doing the work. You look at your analytics."